The uppers are made from abrasion resistant, breathable, water repellent mesh and the lining uses the Gore-Tex Extended Comfort membrane to guarantee water resistance and breathability. The integrated lacing system uses a webbing stitched to the inner stretch fabric while the high frequency reinforcements remain on the external mesh fabric: this allows for an optimal distribution of foot tension and keeps the foot in check without compromising overall comfort. 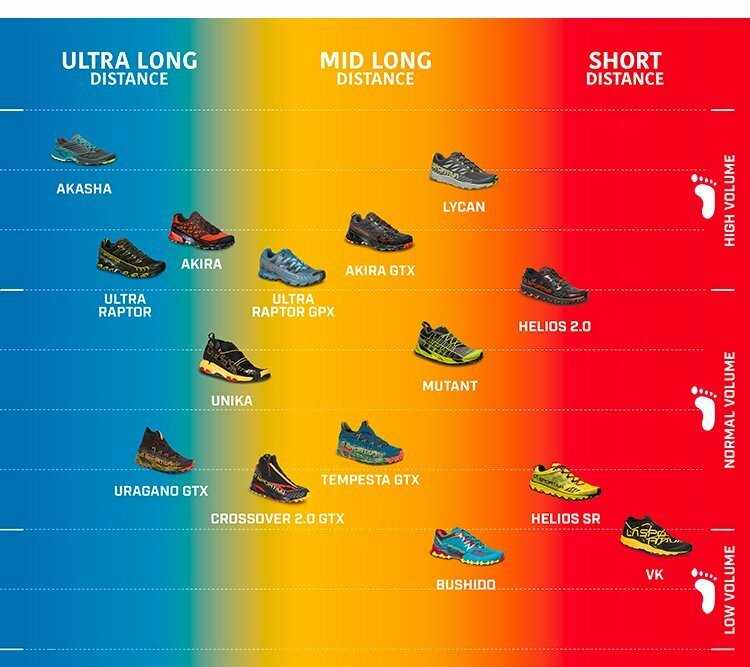 Ultra Raptor GTX brings together the advantages, in terms of performance, of a snug fit construction, to the superior comfort levels of wide fit models. The result is a product that can be worn for many consecutive hours and for endurance on any type of off road terrain both in the winter or in conditions of extreme humidity, thanks to the Gore Tex water proof lining. La Sportiva FriXion XF Super sticky sole. Comfortable shoe, ideal for training and long distance running. Versatile soles, ideal for all types of terrain including stone, scree, grass, moss and mud. Ideal for running either in high humidity or on dry ground. 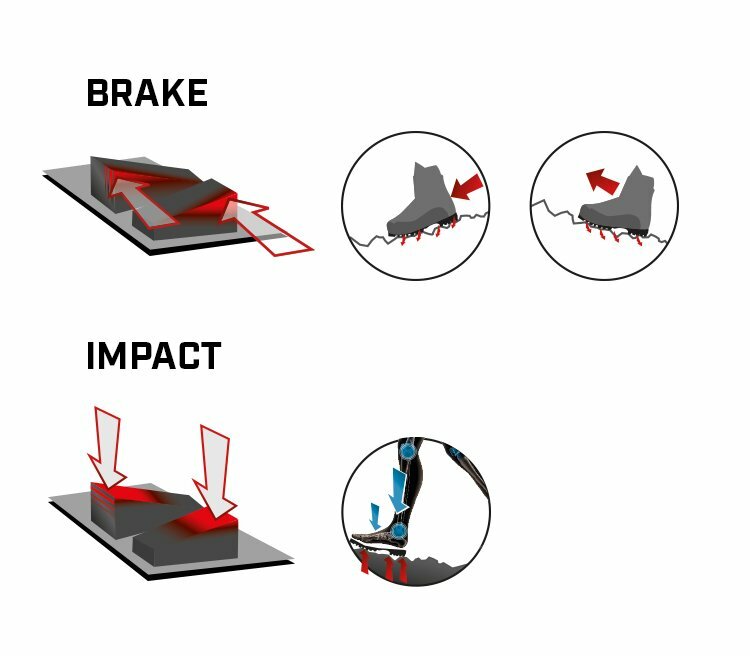 Incorporates the Impact Brake System. The La Sportiva FriXion® compound is the result of extensive R&D aimed at creating outsoles with parameters of grip and durability that respond to all types of use and terrain. 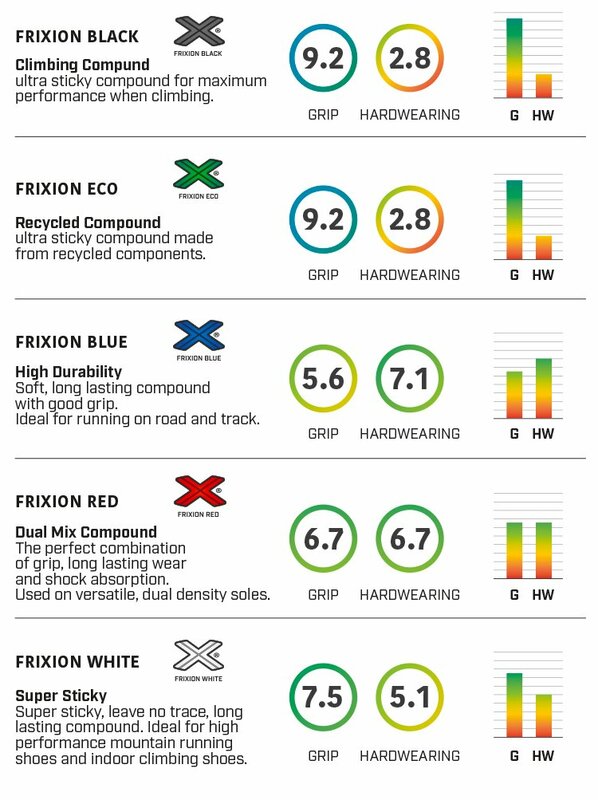 The Frixion range uses 5 custom formulated compounds from mountain running to climbing shoes. The Mountain Running collection models adopt the exclusive La Sportiva insoles by Ortholite, with 2 different thickness. Both models are available in men and women version and differs for the materials’ densities. + Breathable for a cooler foot. + The unique open cell structure creates a moisture management system. + Long term cushioning: insole will retain over 95% of its thickness over time and won’t flatten out. 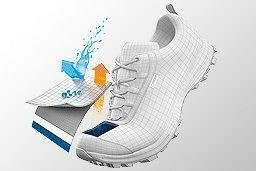 + Anti-microbial agents and washable properties for a more igienic shoe. Ideal for long distance, ultra trail and ultra marathon competitions or demanding training sessions. An extremely protective and shock absorbing boot. Abrasion resistant Mesh + microfiber reinforcement rand with abrasion resistant coating. GORE-TEX® Extended Comfort + “Easy-in” insert in PU leather for easy fit and heel stability. FriXion XF ultra sticky with Impact Brake System andintegrated protective rubber toe cap. + Water proof and breathable allowing optimal climate control thanks to the Gore-Tex membrane that provides a barrier against external atmospheric agents. + Ultra Raptor GTX® combines the advantages, in terms of performance of a snug fit construction, to the superior comfort levels of wide fit model.